RF System Lab, a world-wide leader in remote visual inspection and manufacturer of the VJ-Advance, articulating video borescope, is proud to welcome new customers in a multitude of industries. RF System Lab’s customer list includes companies from industries such as aviation, power generation, oil and gas, chemical processing, manufacturing, and more. RF System Lab, a world-wide leader in remote visual inspection and manufacturer of the VJ-Advance, is proud to welcome new customers in a multitude of industries. RF System Lab’s customer list includes companies from industries such as aviation, power generation, oil and gas, chemical processing, manufacturing, and more. One of RF System Lab’s newest customers in the power generation industry is Exelon, in Pottstown, Pennsylvania. Exelon is America’s leading competitive energy provider, with one of the cleanest and lowest-cost power generation fleets. Its utilities serve millions of electric and gas customers. Exelon is known for excellence in operational performance, continuously improving and exceeding industry standards. RF System Lab’s VJ-Advance fully-articulating video borescope helps Exelon with engine and tank inspections. Representing the Oil and Gas industry, Pacific Drilling in Houston, Texas is another company among RF System Lab’s newest customers. Pacific Drilling is a growing offshore drilling company that provides global ultra-deep-water drilling services to the use of high-specification drillships. Their vessels are all state-of-the-art, high-specification drillships and they remain dedicated to becoming the preferred ultra-deep-water, drilling contractor. RF System Lab’s VJ-Advance, which is battery-operated and completely portable, is an essential addition to their tool kit. Another new VJ-Advance video borescope user is EnerServ in Quebec, Canada. EnerServ is a young, fast-growing company equipped with highly qualified personnel in the maintenance and repair of hydroelectric and thermal energy-generating equipment. These professionals have purchased RF System Lab’s VJ-Advance, articulating video borescope for remote visual inspection of their equipment to save time and money. EnerServ’s team of engineers and technicians have a long history of providing specialized expertise in the maintenance of brand names. RF System Lab would like to extend a thank you to these new clients, as well as all additional clients not listed here. 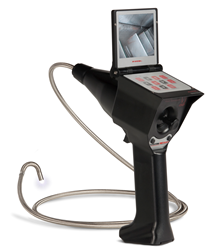 If you would like to demo the VJ-Advance video borescope, you can sign up for a no-cost, no-obligation demo program. For more information on RF System Lab, please visit our website or call 231-943-1171.